Let’s plunge (pun intended!) 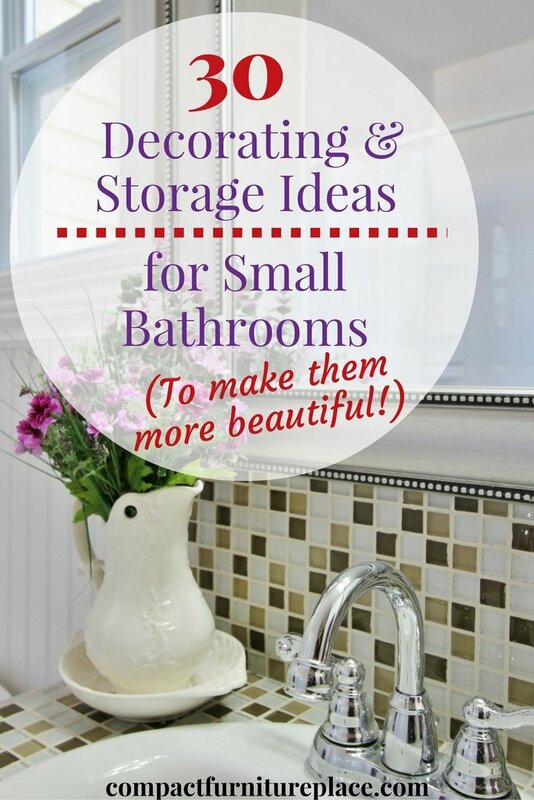 into decorating ideas and storage for small bathrooms. We want to look beautiful. We want our bathroom to be beautiful. But with all the personal care products we need to achieve the former, how can we possibly achieve the latter in the same tiny space? Here are some ideas to both control the clutter and make your small bathroom beautiful. 1. Put shelves over the toilet. The area above the toilet is usually blank wall and a perfect place for storage. Hang shelves (like these) painted the same color as the wall for a seamless look and use baskets (like these) or pretty bins (like these) to store bathroom necessities. 2. Hang baskets over the toilet. Baskets hide clutter nicely and make for perfect storage vessels in a bathroom. Also, they can easily be painted to match any decor, even if you change your color scheme. Click the pin below for full instructions on how to make these, but they’re basically a towel bar and baskets (like these) attached with pretty ribbon. A simple and unique bathroom storage solution! 3. Buy an above the toilet storage unit. Are you sensing a theme here with using the space over the toilet? 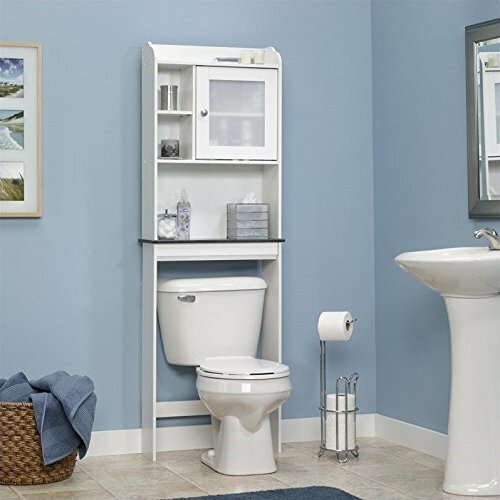 If you don’t want to put holes in the wall from hanging baskets or shelves, an above the toilet storage unit is a super practical solution. They come in wood or metal and a variety of finishes. From towels to toiletries to decorative touches, these space savers offer loads of storage for small bathrooms. 4. Paint the walls a light color. The decorating rule of thumb is that light colors open a room up and make it appear larger. Honestly, I think it’s more important to pick a paint color that makes you feel happy and relaxed, especially in the place where you start your day – the bathroom. However, a light colored bathroom does give more of a spa-like atmosphere. In this picture, the owner used pale green and white and managed to squeeze in a cute storage cabinet. It’s painted the same color as the wall, making it hardly noticeable there in the corner. 5. Break the rules and go dark. If you love the drama and beauty of a dark bathroom, than go for it. Just keep the fixtures white and choose light accent colors so it doesn’t feel gloomy. 6. Show your quirky side. Don’t let your tiny bathroom keep you from showing some personality in your decor. You don’t want to go overboard and overwhelm the little space, but do throw in some touches here and there, like these hand towel hooks (literally) and funky light fixture (like this one). 7. Add a backsplash for color. A peel and stick backsplash is a simple way to add some punch to your bathroom. Peel and stick tiles come in a wide variety of colors and patterns, are easy to install, and can be removed with little to no damage to the wall, which is great if you’re renting…or change your mind often. 8. Use wire hanging planters for storage. Plant hangers (like these) are a handy and attractive way to gain storage for small bathrooms. Hook a second set to the first set for extra long hanging storage. 9. Spice it up with spice racks. Spice racks (these popular Ikea ones work great!) hung near the bathroom sink can hold all those little cluttery bottles. 10. Use PVC on cabinet doors to store curling irons. Here’s the tutorial to make these PVC cabinet curling iron holders. 11. Make these shower razor holders. It’s so annoying when your razor falls off the little shower shelf, right? Problem solved! 12. Make a DIY hanging basket set for storage. These baskets hang from the ceiling and are a pretty way to control bathroom chaos. The tutorial for these DIY hanging baskets is here. 13. Paint a frame around the bathroom mirror. Some decorative touches, like paint or molding around the bathroom mirror, add some interest to your little bathroom. You could even get all fancy and add some stencil flourishes in the corners. I don’t think I would have chosen white, like the image below, but you get the idea. The instructions for how to paint a frame around your mirror are here. 14. Add storage for small bathrooms with shower caddies under the sink. Shower caddies aren’t just for the shower. Choose caddies with a flat bottom so they’ll stand upright and use them as under bathroom sink organizers. 15. Make magnets for your medicine cabinet. Use the back wall of your medicine cabinet to store bobby pins and tools like tweezers and nail clippers with magnets. Here’s the tutorial for some DIY medicine cabinet magnets. All you need are adhesive magnets and fabric scraps. 16. Use a magnetic board to hang up your makeup. How cute would this be hanging out on your wall, like art? Here’s how you can make this makeup magnetic board. 17. Add a shelf above the door. In a small room, you have to look for unused space and use it. The area over the door is often overlooked, but is a great place for storage for small bathrooms. Stash towels, extra toilet paper, toiletries, or anything else, above the door (this shelf would work). Look for nooks where you can add more shelves. It’s all about the shelves, baby! Here, the homeowner added a row of narrow shelves in a nook near the toilet. 19. Hang shelves over the bathtub. The area above the bathtub is another area that is usually blank wall. If you’re short on storage space, put shelves (here’s some!) up there instead of artwork. 20. Build a DIY bathroom cabinet. This sliding barn door bathroom cabinet is so slick! Display your pretties on one side and hide your not-so-pretties on the other. You can find directions to make one in the link above. 21. Use bins to organize under the sink clutter. Here’s a helpful video showing how one homeowner used bins to organize her bathroom cabinet. 22. Hang shower caddies on the wall of the shower. Why stop with one shower caddy when you can use the wall space and hang a few more? 23. Put towel bars on the back of the bathroom door. This is a great idea and frees up wall space for shelves or other hanging storage. 24. Use plant holders on the wall. Now here’s a creative way to get storage for small bathrooms. How handy are these wall planters to stow your blow dryer? 25. Put a 3 tiered tray on the counter. If you have some counter space, use a 3 tiered serving tray (like this beauty) to store the things you use most. You can make your own cute tray with items from the dollar store. 26. Use a file box for hair appliances. The sides of your bathroom cabinets are begging to be put to use. Hang a file box with Command hooks on one, to store your blow dryer and curling iron. 27. Use rope or ribbon to attach your shower curtain to the rod. Instead of shower rings, try using rope or ribbon with your shower curtain. This is a nice decorative touch, especially with some pretty ribbon that matches your decor. 28. Install a second tension rod in the shower. Tension rods (here’s some!) can really increase the amount of storage for small bathrooms. Place a second one in the shower and use S hooks (found here) to hang another shower caddy on it. 29. Use regular curtains on the outside of your shower curtain. Add some warmth and texture to the bathroom with regular cloth curtains. Tie them back, or have them hang to one side, like the picture below. Hide the plastic shower liner behind them. Whether you go dark or light for your wall color, make sure and choose a contrasting accent color to pop out here and there. Just one is best in a bathroom. Here they used a pretty coral, and the few places they’ve used it really stand out. If you liked these decorating and storage for small bathroom ideas, please pin this post!